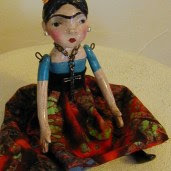 Today I have listed yet another Frida collage on ebay as well as a small art doll. Check them out if you are interested. I have been working very hard this last week and I do believe I must put some time in to clean my house. I am also working on some Christmas things to sell on ebay. Does anyone know how to get people to Etsy other than advertising on my blog? Please let me know as I do have store and would like people to stop and buy there as well as on ebay. Anyway, I might take another couple of days off blogging and get some work done around the house...I don't know that's the beauty of working from home...I can change my mind and do nothing without feeling guilty. Peace and power to all.